Dunes, beach, sea, fine weather and helicopters were all ingredients of the fine day well spent at the International Search and Rescue Event 2009, which was held at Katwijk, a village south-west of Amsterdam, on Saturday the first of August. This event is traditionally held on the first weekend of August, and it is organized by the ‘Katwijkse Reddings Brigade’ (the life brigade), which is run by volunteers. Such life brigades are found mostly along the coastline of the Netherlands, but also at lakes where there are many swimmers. The life brigade has about 30,000 volunteer members, including young members, of whom 5,000 are active lifeguards during the summer holidays. Their primary task is to prevent accidents, by watching the bathers and swimmers. Their second task is to take action if an accident occurs on the beach or in the water. The lifeguards are also trained to provide first aid and resuscitation in the case of a cardiac arrest or a near drowning. They also look after lost children. 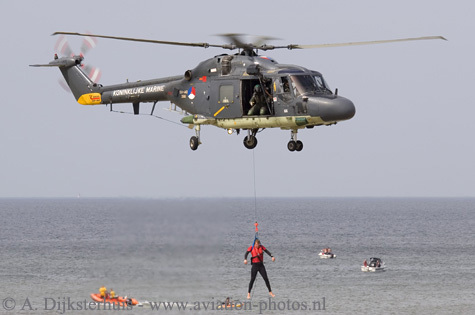 The KNRM, Koninklijke Nederlandse Redding Maatschappij (Royal Netherlands Sea Rescue Institution), was also present. The KNRM was established in 1824 as a maritime life-saving organisation, and it has an impressive history with many high points, although it also had some black days in the past. Nowadays about 1100 professionally trained volunteers, both male and female, undertake life-saving operations using a variety of rigid inflatable lifeboats, and they are on ten minutes standby, twenty-four hours a day, 365 days a year. Even at times when most people prefer to stay ashore because of the terrible weather, these heroes risk their lives to save others! The lifeboats of the KNRM operate under the wings of the Dutch Coast Guard, but they do not belong to this government agency. The Dutch Coast Guard operates two Dornier Do-228-121 surveillance aircraft, which are flown by pilots from both the Royal Netherlands Air Force and the Royal Netherlands Navy. Both aircraft are civil registered, but they are managed by the Air Force, and Jet Support carries out their maintenance. One of these Dorniers made several fly-pasts along the beach, and it was the only fixed wing participant of the day. Several demonstrations took place on the beach, in both the water and the air. A few helicopters were also present. The participation of a German Navy Sea King was unfortunately cancelled prior to the event. An SH-14D Lynx from the Defence Helicopter Command is a regular participant in this event, and it was also the first to arrive in the morning, at the temporary heliport that had been created near the boulevard. The street lighting poles in the parking lot, which is normally used by tourists, were taken down in order to create a safe landing site. The opening act of the day saw parachutists jumping out of the Lynx. A few young members of the life brigade were hoisted on to the beach from the Lynx, in what was definitely their highlight of the day! 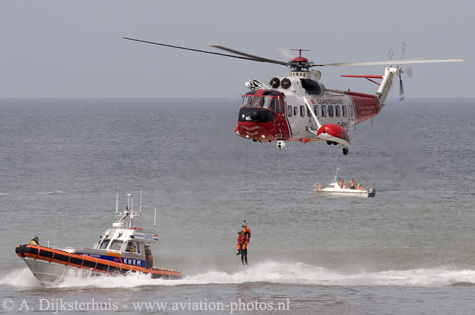 Several combined demonstrations were executed, both by the lifeboats and personnel of the life brigade, and by the KNRM. A Sikorsky S-61N Mk.II, which had been hired by the Netherlands Oil and Gas Exploration and Production Association (NOGEPA), could also be seen. 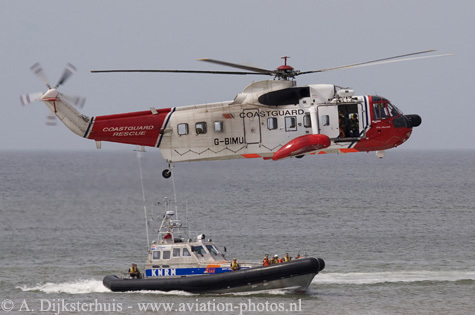 The Sikorsky is based at De Kooy, which is close to Den Helder, and is well placed to respond to offshore incidents. This helicopter is also available for other search and rescue actions, and was therefore a welcome participant. A car accident was simulated at a nearby junction to demonstrate, and to explain to the spectators, the work of several services, such as the police, paramedics and firefighters, and how they co-operate at the scene of an accident. 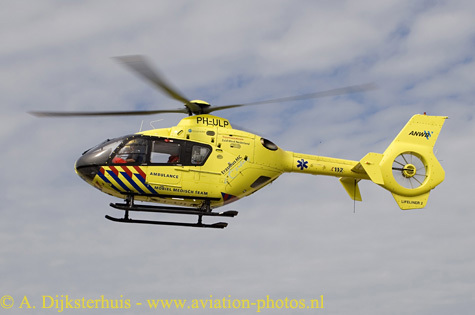 The casualty was seriously injured and needed the assistance of one of the Mobile Medical Teams, which use the EC.135 helicopter for their transportation. The MMT was, fortunately for the spectators, available at the time of the simulated accident, and the HEMS helicopter arrived on the scene, and landed on the temporary helispot. At the end of the day, many spectators returned to their homes, hopefully having learned a lot that day about the tasks and duties of the lifeguards. The next time they return to the beach to sunbathe and swim, they will certainly have a greater appreciation of this voluntary work.